We see so many white and gray kitchens these days that this vivid blue kitchen in East Moriches, New York, really jumped out at me. The homeowner says she was going for “a French blue, with a little purple in it, although I never met a blue I didn’t like.” Decorative paintings she commissioned like this one on the pantry door make the room even more colorful. Not only did they paint the cabinets and woodwork to match a pair of candlesticks the homeowner loved (which you can see in the photo below, on the counter), but they threw in some blue tile for the backsplash and blue fabric for the banquette. That’s a lotta blue! She says she doesn’t really cook much but wanted her new kitchen to be the family gathering place. Her granddaughter told her if she ever sells the house, she has to make the new owners promise not to change a thing. Would you be brave enough to try something this bold? Read the interview with the designers and homeowner and see more of the photos by Trevor Tondo at House Beautiful. 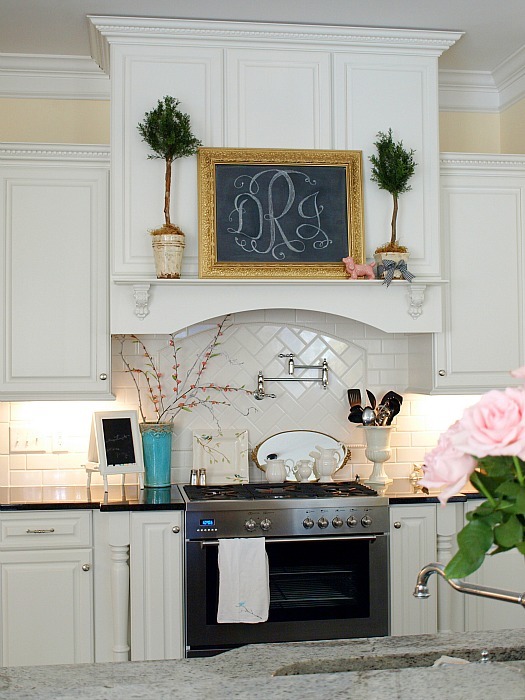 A Lake House in Alabama Named "Best New Home"
Oh, I love that the owner decorated her kitchen for her enjoyment and not future resale value! Our homes should reflect our personalities and not what trends dictate. I love that the homeowner went with a colour she adored rather than only thinking of resale. It’s bold, but it is oh so beautiful! I have always respected people that adorn their homes with things, colors, and styles that make them happy, and are not slaves to trends and conformity. I think hanging out in this kitchen would be uplifting and fun. Wow! Can you imagine how this much color makes the owner happy? I don’t know if I could do it, but I like it here. Good for her! If I walked into a house and saw all of this color, I would immediately know it was the house for me! I love the bright color and warm atmosphere she has created. It looks beautiful! I love blue and white. There is even a decorating book I have featuring only blue and white decorating. Glad she designed her kitchen into what she wanted. Sometimes we aren’t brave enough to follow through. Well, that’s fun! I like the individuality too. My favorite all-blue room is that bedroom in Nights in Rodanthe. Didn’t like the movie so much, but that house was fab. That was a fun movie house! I like.I dont see anyhint of purple in the blue. And since she doenst cook much it is easier to havea colorful kitchen as she doesnt cook much so she doenst have to deal with finding grease splatters or any food splatters on the blue tile/paint. Good luck with that. Buyers may promise and change it anyways. After spending 100k 200k 500k on a house(NY is expensive) who wants the sellers to tell them what to do ? I really like this. Not sure it’s appropriate for a cold climate home, but I can imagine this as a vacation kitchen in the Caribbean or some other such balmy place. Such a beautiful shade of blue!!! That banquette!! WOW!!! Those windows! WOW! I love colour in the kitchen. My first home was a century house and the kitchen had beautiful blue weathered cabinetry with white procelain knobs. It was so fresh and happy! What a lovely place to make memories with her grandchildren. This is gorgeous! And those windows! Love this! I agree, I’ve yet to meet a blue I didn’t like as well. I think it’s very fun, but I wouldn’t want a kitchen that color. What a dream kitchen for family everyday AND entertaining! Love! 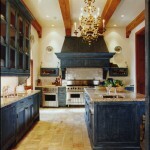 Fantastic kitchen! I love the large windows and the amount of natural light pouring in which calms down the strong colour. Washing dishes looking out at the view must be a pleasure. My favorite kitchen that you have posted yet! I love the color. Intense yes, but a refreshing change from the grey, beige, or “low key”. I especially love the wall mural. What a great accent, very inspiring. Not a fan. Just too intense for me. The turquoise kitchen was better. Such a great kitchen! I love the layout and the banquet area and the real hood over the range. And the blue. And the windows. And the decorative painting. I love my white kitchen but this is such a refreshing change. I’m in love with the aqua tiles on the backsplash. The banquet fabric looks so fun!! It certainly is HAPPY!!! At first I was thinking no, but I warmed right up to it! I would like to have coffee there for sure! No. I would never be so bold. But! I love it when someone else is and I get to see it and say, WOW! That is beautiful. So refreshing. Good for the homeowner. I’d come and have coffee with her any day. I had to laugh at this post. I blew all my kitchen remodel budget on a cobalt blue Viking range. I couldn’t stand going to the store and being told white or stainless which will it be. When it came time to make the decision all I could think of was racing red or cobalt blue-am I making the right choice. This is so different and beautiful! 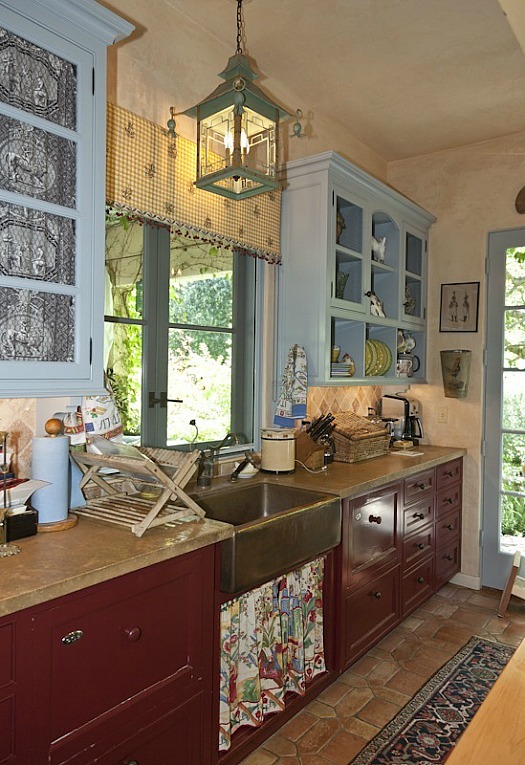 I would love to have a kitchen that is this out there and cheerful. Good for them for branching out.